MAC has launched quite a few new things this year and I feel I blinked and almost two months have already passed by. New products roll out at lightening speed which I can barely keep up on so today I have a roundup of several launches. Up first are two new highlighter palettes called Hyper Real Glow ($39.50 each). There is a warm gold option called Get it Glowin’ and a cool pink option Flash + Awe. They come in cardboard packaging with a magnetic closure and mirror inside. Both seem pretty sturdy in packaging. The shimmer is very smooth and doesn’t emphasize pores or imperfections on the skin. They can be built to a high shine frost but if you layer them over blush or bronzer the shimmer effect is smoother and not quite as intense. The colors in each palette aren’t the most unique – if you own a lot of highlighters these will probably be similar to other MAC shades. 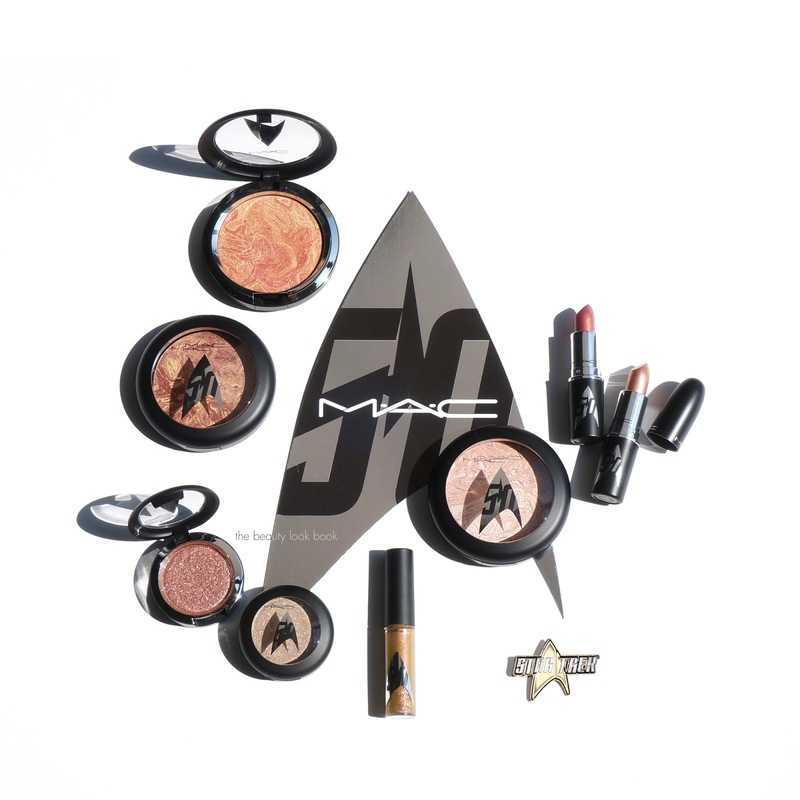 The formula is really good and I think these are a pretty good value for the price. Get it Glowin has two golds that look really similar on my skintone, the variations are slight once on the skin. Then there is one warm bronzey shade. At the moment I’ve just started to get back a little of my tan after being in Miami over the weekend. Right now Get it Glowin adds a lot of warmth and glow to the skin. As I get darker I suspect it will be more of a highlighter. Flash + Awe surprised me because I was almost certain this would look white on my olive skin. The shades are pale and definitely highlighter material but they aren’t as pale as I anticipated. The colors are similar on my skin but I really love the soft diffused pink glow these give. Lasting power is really good with these powders and there is very little powder fall out. Next are the new brushes. MAC redesigned all their Makeup Brushes with synthetic materials. Some of the classics have remained but there are also new shapes and options. If you want a more detailed review of their brushes I can do a separate post on them. For now here’s a quick look at some of the new ones alongside a few others I had purchased before. Some brushes like 125S, 128S and 127S are split fibers which gives two different effects. The one side you’ll see below is the brown fibers for powders and the other side is a different material more ideal for creams. All the brushes are very well made with smooth and super soft tips. My MAC brushes have lasted a long time over the years, some I think I’ve had since 2003 and they’ve held up without any issue. So far the synthetic version seems to perform just as well as the originals. My top 4 MAC brushes are the 239S, 219S, 140S and 217S. In addition MAC has also started carrying beautyblenders in their stores and on their website. These are the best makeup sponges I’ve tried. Nothing really quite compares to them! Last but not least are some new additions to skincare. There are two new products in the Mineralize Skincare Line. They launched two new charcoal infused products which are designed to detox the skin. The Mineralize Reset and Revive Charcoal Mask ($31 for 100ml) is a gentle purifying mask that removes excess oil without stripping the skin. On the face it feels really soothing. It will shrink a little as it dries but not so much that it feels overpowering. Skin is left feeling a lot more clean and less oily. They’ve launched a Mineralize Charged Water Charcoal ($26 for 100ml) spray with you can use before moisturizer or to set makeup. To me this has a similar feel to the MAC Fix+ on my skin. I do like to use it as a freshening product before I apply moisturizer, but to me the effect is almost identical to the MAC Fix+ just a tad bit more moisturizing. Perhaps my favorite launch is the MAC Prep + Prime Fix+ Scented Mist ($26 each for 100ml) . These came in the mini sizes last year in Rose, Lavender and Coconut. I stocked up on TONS of these since the minis were limited-edition. I’m beyond thrilled that they launched these in the full size. I love these to set makeup, refresh the skin or even to prime before moisturizer and foundation. I find them really versatile and the scents are soft and not overpowering. That wraps up my MAC roundup! Of course as I’m finishing this post more launches have already arrived. I’ll be reviewing more in the weeks to follow. You can find the new MAC launches out now. Available online at MAC, Nordstrom, Ulta Beauty and Saks Fifth Avenue. MAC launches provided courtesy of MAC for review.